This is an easy spin on a traditional hummus; it has a little spinach for color and flavor, and edamame (fresh soybeans) to add a jolt of plant protein as well as texture. Instead of serving it with bread or crackers, I like to use endive leaves; their size and shape are perfect for scooping the creamy hummus. Mince the garlic cloves in a food processor. Add the spinach, beans, edamame, lemon juice, and tahini. Pulse until the mixture is smooth. With the machine running, slowly drizzle in the oil until the mixture is smooth and creamy. Blend in the salt, black pepper, and cayenne pepper. Transfer the hummus to a bowl and serve with the endive spears. 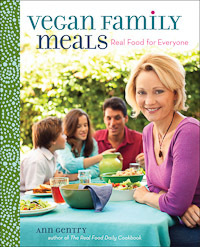 Reprinted with permission from the book Vegan Family Meals by Ann Gentry. Copyright © 2011 by Ann Gentry. Published by Andrews McMeel Publishing.